Exciting Acai Juice Just Officially Launched! 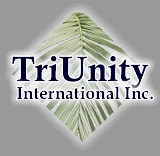 TriUnity Launches the Best tasting Acai juice on the market. Powerful 3X8 Comapany Forced Filled Matrix with Dynamic Compression! Acai was recently featured in the Wall Street Journal, Matt Lauer NBC News, Ophra with Dr. Perricone and Radio. have amazing healing and nutritional properties. Why Acai? Acai is 10 times more Anti-Oxidant than Noni, Xango and 4 times that of the Goji berry. Powerful Amazon Rainforest acai berry nectar. Acai is called the "Viagra of the Amazon" by NBC News. Acai has astonishing antioxidant properties. Six times more antioxidant power than most other juice products! for maintaining heart health and healthy cholesterol levels. Vitamin B2 (Riboflavin), Vitamin B3 (Niacin), Vitamin C, Vitamin E (tocopherol), iron, potassium, phosphorus and calcium. Acai Plus contains all the essential amino acids. Company CEO - Greg Gunderson. Greg also owns 4 multi-million dollar companies and has been a successful entrepreneur in owning a staffing company, lead generation company and nutrition company for the last 28 years.